A dirty and dingy bath is an unappealing sight, but the bathroom is one of the last remodeling projects homeowners want to tackle. Replacing old bathtubs and fixtures is an expensive and messy project. Most people don't realize that your bathtub and counters can be painted with enamel paint. Cast iron tubs are dipped into enamel during manufacturing to give them that smooth, perfect surface. You are simply imitating that same effect with a paint brush. A dingy bathroom can me made over with paint. Paint your bath using enamel paint. Enamel paints are a good choice for bathrooms because they go on smooth and create a strong, durable finish. Enamel also comes in a wide range of colors. You can find enamel paints at your home improvement store. 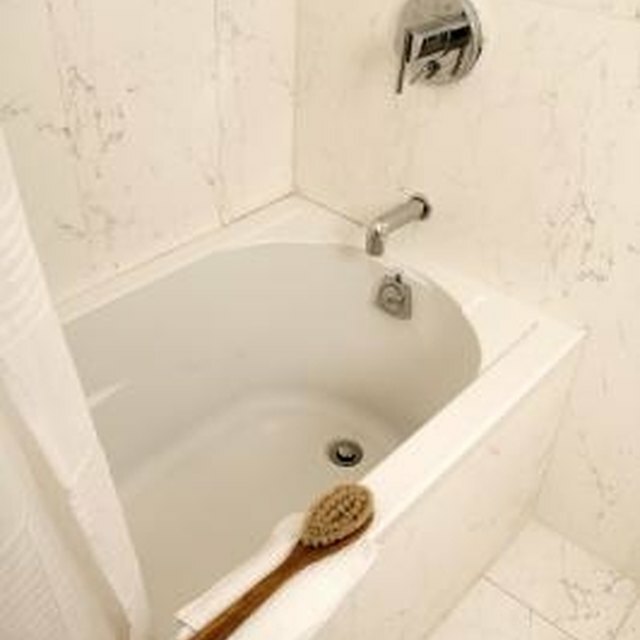 Paint the bath using a good-quality paint brush. Avoid brush strokes as much as possible by keeping enough paint on your brush. Paint in one direction to reduce visible lines. Apply two coats of paint, allowing the first coat to dry completely before applying the second.